Today is an important day for the tablet market. The Tab Pro and Note Pro start shipments in the world today. It seems like Samsung is working on it’s next high end tablet. SamMobile.com came across a UA Prof listing of a new device named SM-T805. They think that this is the next high end tablet, as Samsung Galaxy Tab Pro 12.2 it’s named SM-T900. Other indications that this is the new high end tablet is that is had a resolution of 2560×1600, which is the same as the Tab Pro and Note Pro lines. The device will run on Android 4.4. For now, these are all the information that came on the web. 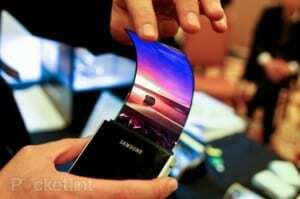 SM – T805 is likely to be the next curved tablet from Samsung that is rumored online. The patent filling mentions a product with curved left and right sides that makes holding it more easily. This new device can be the first AMOLED tablet from Samsung. In December, there were information that Samsung started producing 9 inch and 10 inch AMOLED screens for tablets, that will appear in the first quarter of 2014. It’s possible that Samsung will still use LCD screen for low and mid segments, as for high premium segment they will use AMOLED screens. It’s a big probability that the SM -T805 to be the first device with this technology. There are rumors also about software development for this technology, so there are indications that his new product will see the light of the day pretty soon. Other leaks say that there are patent for SM-T800 and SM-T801 meaning there will be different variants of the tablet with WI-FI, LTE and 3G configurations.